Rob is Hampton Roads busiest Birthday Party Entertainer performing throughout Virginia and North Carolina including Chesapeake, the Eastern Shore, Hampton, Moyock, Newport News, Norfolk, Poquoson, Portsmouth, Richmond, Smithfield, Suffolk, Virginia Beach, Williamsburg and Windsor. For the best in Birthday Party Entertainment, Family Entertainer Rob makes your child the Star of the Show! 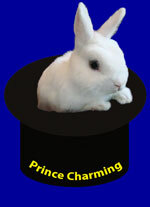 Prince Charming, the world's cutest bunny rabbit magically appears at every magic show! Rob will even make your child float in the air! 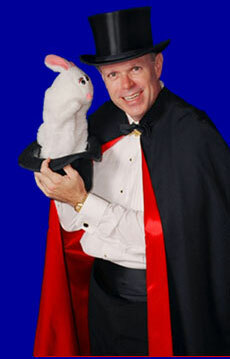 Rob is the only magician in VA who appears in top hat and cape. During the birthday party magic show your child also wears a top hat and cape - which makes for great photos. The show is 45 to 50 minutes of fast-paced fun and laughter with your child "on stage" for nearly half the show. All the children receive a small magic trick. The birthday child receives a deluxe gift bag and magic wand! Rob is also the Hampton Roads leader in Magic Camps for Kids, Magical Library and School Assembly Programs promoting reading (Including Title I Family Events), PTA/PTO Family Nights, Pre-Schools/Child Day Care Centers, Banquets, Military Events, Scout Events and Fairs. Book the professional award-winning comedy magician who is licensed, insured, advance degreed (JD, CPA) and offers a money-back guarantee if you are not delighted. 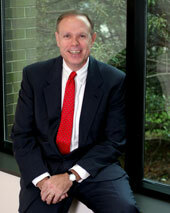 Most entertainers offer none of these assurances and no one but Rob provides all of them. 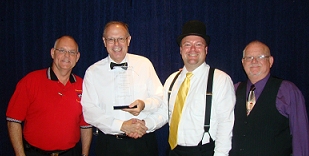 Go with the pro who has rave reviews from thousands of magic shows. Rob makes your child the STAR of the show! Blue & Gold and Scout Events - Rob provides fun family entertainment for scouting events. Corporate Events - Rob provides terrific entertainment for executive events, banquets, sales meetings, trade shows, company picnics and holiday parties. Fairs and Festivals - Rob is a wonderful entertainer for Fairs and Festivals. To learn more, please click HERE. Military and Public Service - Rob supports the men and women in the military and public service with wonderful entertainment and special pricing. Pre-Schools - Rob is a wonderful entertainer for young children. Rob's pre-school shows are 30 minutes of fun for all the children.